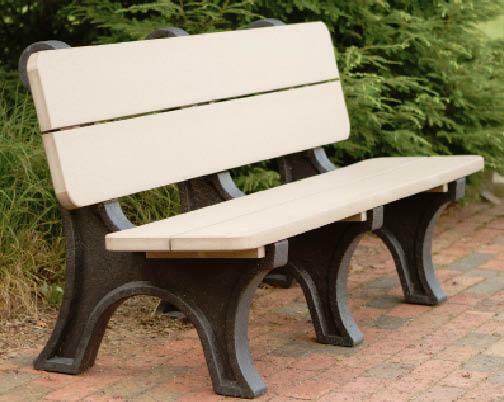 Grab a seat and enjoy the outdoors with our Berlin Gardens Poly Lumber Park Bench. Perfect for your backyard or garden, this poly lumber bench will withstand decades of life outdoors without requiring the maintenance associated with traditional wood furniture. Available in any array of poly colors, get the perfect bench to incorporate your unique tastes into your outdoor decor! Our Berlin Gardens Poly Lumber Park Bench is also perfect for commercial use. Give your guests a comfortable place to sit and relax while adding to your outdoor decor. Backed by a five year warranty for commercial use, your investment in outdoor furniture will last many years! Grout to Seat Height: 15 3/4"